Choose from our wide range of innovative paint products and systems in the Glasurit e-Shop - for brilliant varnishing results as well as simple, fast and efficient work. Here you will find all dealers who exclusively distribute our Glasurit products. Do you have questions about our products or our consulting services? Feel free to contact us using our contact form. It’s easy: Priming, sanding – ready! With this motto in mind, Glasurit has reworked and refined its undercoat materials. 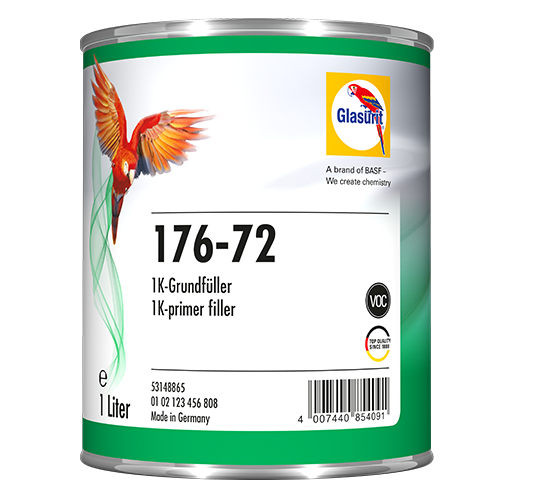 The latest product to join the team is 176-72 Glasurit 1K Primer Filler, dark grey, water-thinnable. The new primer filler for RATIO Spot Repair offers excellent sandability, universal drying options and today already complies with future VOC limits. It is part of the RATIO Aqua System and replaced the 76-71 1K Primer Filler in May 2008. Glasurit 176-72 1K Primer Filler makes it easy for bodyshops to stay future-orientated. The new primer filler’s improved properties boost paint application efficiency. Compared to 76-71 1K Primer Filler, 176-72 offers even better sandability. For bodyshops, this reduces sanding material consumption and cuts sanding times. On top of that, the new primer filler now offers users universal drying options. 176-72 can be baked, air-dried or cured with infrared lamps. That makes it especially well-suited for repairing cosmetic damage. The new primer filler is an economical 1K product with a potlife of 4 weeks. When developing the waterborne primer filler, Glasurit had an eye to the future: with its VOC content of under 250 g/l, 176-72 already complies with the VOC limits, which in future will apply to undercoat materials as well. Glasurit 176-72 1K primer filler isn’t just efficient and future-proof, however. Its users are also convinced by the high quality they have come to expect from Glasurit products, for instance, excellent appearance.